For full company contact information, please view our contact us page. Are you inquiring about the itinerary on this page? Yes - I would like request a quote/modification/other info about the tour on this page. No - I would like a tour recommendation, based on requirements I will outline. It need not be related to the tour on this page. Do you prefer to make your own accommodation and activity bookings, or would you prefer an inclusive package? Inclusive - I'd like accommodations and activities all included. Recommend Accommodations (but I'll book myself) - I prefer to place my own bookings, but would like suggestions on which accommodations you recommend. DIY Accommodation & Activities - I prefer to choose and book accommodation & activities myself (ie. seeking guide & vehicle only). What other accommodation types would you be interested in? Yes, its my first visit. No problem modifying this later, your quote will be revised accordingly. Yes, I'd like to modify it to suit me better. No, I'd like a quote based on the itinerary as currently outlined. I'd like the itinerary adjusted to ensure a specific end date. I'd like extra nights in some existing stops (ie. a slower pace). Extend the itinerary to make it longer. I'd like some locations or overnight stops removed. I'd like to specify something else. Please suggest a longer variation of this itinerary for me. Let me specify the additional destination/s I'd like included in the itinerary. Which extra destination/s would you like included in the itinerary? Anything else you'd like changed about the itinerary, please outline here. Dig out your own hot tub in the sand at Hot Water Beach, on this 6 day luxury tour of some of the North Island’s most exciting highlights. 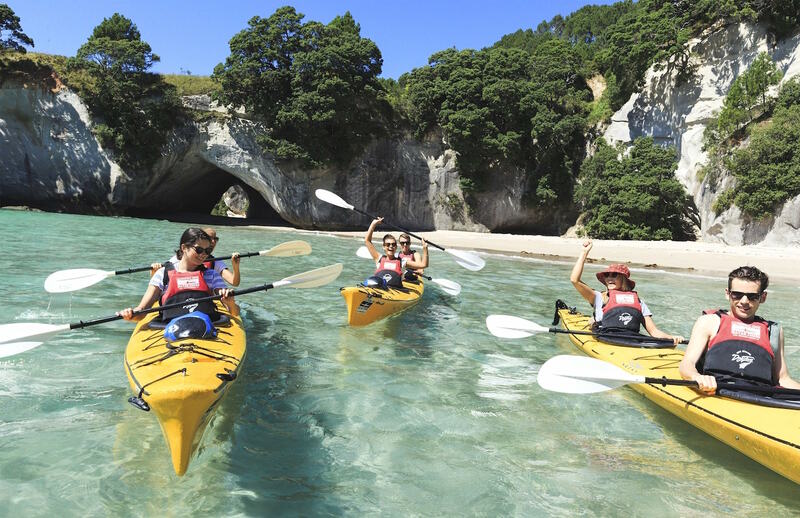 You’ll explore the beautiful Coromandel Peninsula, with its rolling hills, Pōhutukawa lined roads and superb beaches. You’ll continue to Rotorua, which offers a superb range of thermal areas and spas. In Rotorua you’ll also find other great attractions including the Redwood Forest, Kaituna rapids (the highest commercially rafted rapids on Earth), and extensive Maori cultural experiences. You’ll make your way back to Auckland with time to stop at Waitomo Caves, which can be toured in relaxed or adventurous style – if you want to experience Black Water Rafting or cave abseilling, Waitomo is the place for you.